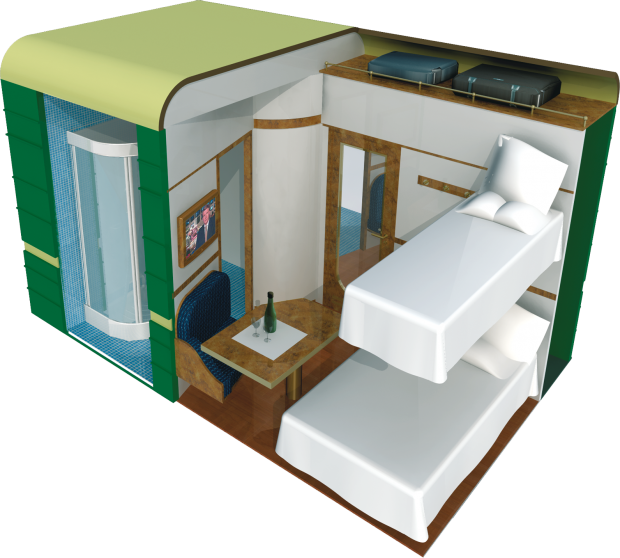 This category of compartment is the height of comfort on the Trans-Siberian, offering 7.15 sq m (77 sq ft) of space. It has two beds, with the upper measuring 82 × 174 centimeters(32.3 × 68.5 inches) and the lower 120 × 184 centimeters (47.2 × 72.4 inches). This compartment also offers a small sofa, a large table, and a large closet. The Bolshoi category has a private bathroom equipped with a sink, toilet and separate shower. Each Bolshoi Platinum car has only five compartments.